Loyalty retail software to reduce food waste. Modern marketing is all about storytelling and one brand that’s telling a great story and earning great reviews in the process is an app called ‘Too Good To Go’. Described by Vogue magazine as ‘food delivery with a green discount’ – Too Good To Go is one of ten apps they reviewed recently in this emerging area – companies who are tapping in to consumer demand for companies with conscience – and nowhere does it seem more apparent than in the food industry which affects us all. Combining economic objectives with social goals – these companies are part of an approach entitled ‘Conscious Business’ which has emerged from the field of Corporate Social Responsibility, which intentionally sets out to ensure that the needs of profit, people and the planet are all met equally. It sounds challenging, however food waste is an issue that concerns over seventy-five percent of people – at least in UK research. It’s also been the subject of some viral videos on social media, one of which has had over 28 million views to date, as well as radio and TV programmes by media organisations such as the BBC in the last decade, so there’s no doubt this issue is universal – and one that retail technology can help solve. We’ve previously discussed how the Karma app connects left over meals from restaurant owners with cost-conscious consumers, so here we’ll review how Too Good to Go compares in terms of it’s reach and relevance. The app is built as a digital marketplace for food retailers and restaurants to sell their leftover food to waste and cost-conscious consumers. Retailers create a ‘magic bag’ of food which is discounted from the original retail price. The contents of the bag are not specified on the app pre-purchase. Customers pay for the magic bag on the app to reserve it, and book a time to collect it from the store. Customers with concerns such as food allergies are advised to contact the store to get the information they need that the contents of their magic bag will be safe for them to eat. All food is available for collection only (there is no delivery facility) and is designed as a take-away for consumption off-site. Watch the video showing how Too Good to Go works. In just two short years, Too Good To Go has expanded beyond its home country of Denmark to eight other European countries. Founded by a group of Danish entrepreneurs, its female CEO Mette Lykke, has a proven track record in building compelling products that meet clear market needs, having co-founded the fitness app Endomondo in 2007, which was acquired by Under Armour for $85 million. A community of over 465,327 users they call ‘Waste Warriors’ in the UK, and a total base across Europe quoted at over 3 million people. More than 1,381 partner stores across the UK. In Denmark, the company boasts over 16,510 businesses taking part across bakeries, grocery stores and restaurants. Over 428,567 meals have been saved in the UK alone – equal to over 857,134 Kg of CO2. One case study describes a bakery that has sold over 9,000 bags of food that would have otherwise been thrown out – a waste reduction of 90%. The “Too Good To Go” Magic Bag. 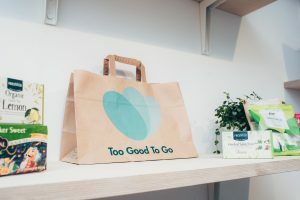 Too Good To Go has investor confidence in its model and its ability to scale globally, with almost $5 million raised in 2018 to fund its expansion plans. Now successfully operating in nine countries all shown under the heading ‘Going Global’ there are rumours that the United States is next in line to benefit from this socially sounds yet commercially appealing idea. With sixteen competitor ideas already listed in that country to address this same global food waste problem, it’s anyone guess at this early stage as to what brand will ultimately win consumers hearts and minds in the race to save food. And if the original intention of the founder of Too Good To Go comes true, perhaps a day will come when they will ALL be delightfully obselete. Let’s hope it’s sooner rather than later.